It is with heavy hearts that we inform our followers of the passing of one of our past employees and son of the owner Stanley Kanterman. 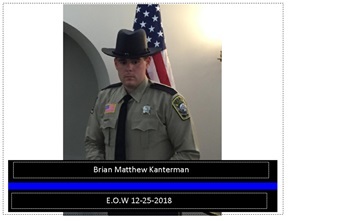 End of Watch for Brian Kanterman, 25, was December 25, 2018 in Stafford, VA.
Mr. Kanterman graduated from Franklin Township High School where he was a drum major in the marching band. He attended Rutgers University before relocating to Virginia, where was a Deputy Sheriff and a Certified Correctional Officer for Stafford County. He was also a retired captain from Franklin Township EMT and a long standing member of Franklin Fire. Consistent with Brian’s wishes and his dedicated service, memorial contributions can be made in Brian Kanterman’s name to any local Fire, EMS, Police or animal shelter of your choosing. He wished to be remembered wearing his first law enforcement uniform. He was proud to serve his home community of Franklin Township, Somerset, NJ and his new adopted home of Fredericksburg, Stafford County, VA. He will be greatly missed by all he touched. We are all looking forward to celebrating the holidays, but unfortunately there are people out there trying to steal your joy. From websites offering products for almost free to scammers making direct contact, you must be on guard. The most vulnerable, our seniors, is the preferred target of scammers while tech savvy adults are the targets of on-line schemes. Take the time to discuss these scams with family, friends and colleagues. It may be the best gift you give to someone this holiday season. On-line discount site. Unbelievable prices for the most wanted and difficult to get products. Enter all your info, credit card number and you are good to go. So is your identity and credit limit. Both sold to out of country thieves and you never get what is ordered. Out of country medical emergency. You receive an email from a friend/family member (obtained from hacked sites) asking you send money. They are in need of emergency medical treatment and their insurance won’t covered. Please send money now. It’s a matter of life or death. Emergency repairs. Scammers target seniors saying they were in the area working on another home damaged from a recent storm and saw the same problem on the seniors roof. They tell the senior if not fixed immediately, they will have to deal with damages from a leak and won’t be covered from insurance. They tell the senior That since they are in the area they will do the repairs for a discount. A 50% up front payment is needed for supplies. Unfortunately once they get the money they are Gone With The Wind. Upon successful completion of these Schools, students earn their Certified Claims Professional (CCP) in that specialty. Stan sits on the Executive Council and created many of the courses taught in the School of Fraud. The students, who are from many of the national insurers, law firms and law enforcement come to learn about all aspects of insurance fraud. In addition to the Certified Claims Professional (Instructor) designation, Stan has the Fraud Claims Law Associate, Master Insurance Fraud Instructor, Associate Certified Fraud Examiner, Certified Identity Theft Risk Manager designations and is a licensed Private Detective. As Hurricane Harvey continues its path through Texas and Louisiana, it is anticipated that there will be more than 500,000 flooded vehicles and trucks that will have some form of insurance claim filed by the owners. Many companies have a “Destroy Only” philosophy when it comes to flood vehicles, however the National Insurance Crime Bureau (NICB) estimates that as much as half of the flood vehicles will be sold for salvage. Unfortunately, some states will allow a person to convert a Flood Title to a clear Title with little or no documentation of repairs. These vehicles then can be resold to unsuspecting consumers. To combat this, the NICB has established a VIN Check system that allows a consumer to search the VIN of any vehicle or truck they wish to purchase through their theft and flood system. You can go to https://www.nicb.org/theft_and_fraud_awareness/vincheck to perform a free search. Please remember that any database, even the NICB’s is only as good as the information they receive. As such, if a company does not report to them as required by law, or if the vehicle is uninsured, the database will not have any useful information. It is always a good idea to get a full history on any vehicle you buy. Steganography is the practice of concealing a file, message, image, or video within another file, message, image, or video. This has often been used to pass on viruses to computers. A "simple click on the pic and your computer is sick" (sorry had to put that in). Many smart phone users believed they were immune from this problem as the program was not written for the phones internal operating system (IOS). Unfortunately you are not safe. There are Steganography programs specifically made for the phones IOS's and people are having their info stolen or worse. These Steganography programs are being sent by text, email and through social media. Do not just open attachments if you do not know who they are from. Stop randomly doing the Cut, Copy and Paste being asked by some social media posts. Summer is officially over. Kids have gone back to school. Unfortunately this means new scams, revival of old ones and heightened risk of identity theft. Unpaid Tuition - Caller claims to be from the financial department of your kids college and states the loans or scholarship are not sufficient to cover this years fees and balance needs to be paid immediately or you kid is expelled. What's worse you can't call the school as they wont talk to you. What to do? Don't panic. Ligitimate schools will give you enough time to resolve. A quick text to your kids and they can call financial aid for verification. Never make an immediate payment. Kidnap Call - Caller claims to have kidnapped you child and is demanding immediate payment to let them go. As upsetting as it sounds this is Often a scam. Set up a 9-11 text to your kids that lets them know you need to speak with them ASAP. Their phones are on 24/7. Identity Theft - both you and your kids have been filling out multiple forms. Also there will be a push by local vendors to set up lines of credit for your kids. Unfortunately this means that a lot of information is freely flowing. Make sure you set up banking alerts every time there is any banking activity. Contact any of the credit reporting agencies and purchase their credit protection services. The alerts can thwart ID thieves before they can ruin your credit. Simple advise. Never react. Take a deep breath and think. Never give information to someone who calls you. Always get call back numbers and verify the contact is who they say they are. Mr. Stanley Kanterman, Vice President, Carrier Specialty Service, LLC and the President of Investigative Resource Center, Inc. will be speaking at the CLM 2015 Claims College School of Insurance Fraud. The 2015 Claims College will be held in Philadelphia, Pennsylvania, September 9-12. Each school is comprised of three levels and successful completion of all levels in a particular school will earn participants a respected and sought after designation, which will become the industry standard for identifying top-notch claims professionals. For individual schools, levels consist of pre-course reading materials, in-class instruction, group projects and an exam. The Claims College is not an industry seminar or conference, this is a true educational experience designed to help educate and grow the claims profession. This quick thinking young lady contacted the manufacturer of the sugar and was advised of a recent theft. she was given my name and contact number as Investigative Resource Center, Inc. was assigned the investigation by the insurance company. Operation Sweet Tooth was born. With the assistance of Len Paquette of Bleu Wing Investigations we were able to put together a coalition of Local Law Enforcement and the Tri-County Auto Theft Task Force. The sting was set. The suspect was contacted and he agreed to a buy on June 25, 2015. Marked money was prepared, surveillance locations established and when the suspect arrived he was glad to carry in the 50 pound bags of sugar once he was paid with the marked money. Our agents were able to verify the lot numbers from the bags of sugar and they were a direct match to our stolen load. The suspect was arrested on scene and began his quest to cooperate with the task force. He gave up two additional suspects who were arrested and who also began to talk. The location of our stolen unit and the balance of the cargo was obtained and it was determined there were multiple stolen tractors and trailers at the location. As such, a search warrant was issued and in addition to our equipment, more than 8 additional semi-tractors and trailers were recovered. The estimated value of the recovered units and cargo may exceed $1,000,000. As the investigation continues we believe additional suspects will be charged with various other crimes. We appreciate the assistance of the Hamtramck Police and the members of the Tri-County Auto Theft Task Force. "To perform the most extensive, in-depth and good faith investigation possible, while helping reduce the expense and indemnity exposure of our clients."